Find artworks, auction results, sale prices and pictures of Ludger Tom Ii Ring at auctions worldwide. 13 3/8 by 9 5/8 in. ; 34 by 24.5 cm. Sold privately by Sotheby's, 2002. A. Lorenz, Die Maler tom Ring, exhibition catalogue, Münster 1996, vol. 2, p. 639, cat. no. 194, reproduced. Anonymous sale; Sotheby's, London, 12 July 1978, lot 50, where acquired by the following. Anonymous sale; Christie's, New York, 19 April 2007, lot 55, where acquired by the present owner. G. Langemeyer, Stilleben in Europa, Münster, 1979, pp. 316-7, no. 166. A. Lorenz, 'Die Blumentstillleben von Ludger Tom Ring', Kunst und Antiquitäten, 1993, pp. 16,18. Münster, Westfälischen Landesmuseums für Kunst und Kulturgeschichte, Die Maler Tom Ring, 1 September-10 November 1996, no. 79. Vic-sur-Seille, Musée départemental Georges de la Tour, Un cabinet imaginaire: Natures mortes et vanités du XVIIème siècle, 10 May-4 September 2005. 13¾ x 6 1/8 in. (35 x 15.5 cm.). Anonymous sale; Christie's, New York, 19 April 2007, lot 55 . G. Langemeyer, Stilleben in Europa, Münster, 1979, pp. 316-7, no. 166, illustrated. A. Lorenz, Die Maler Tom Ring, Münster, 1996, pp. 396-7, no. 149, illustrated. A. Lorenz, 'Die Blumentstillleben von Ludger Tom Ring', Kunst und Antiquitäten, 1993, pp. 16 and 18, illustrated. Vic-sur-Seille, Musée départemental Georges de la Tour, Un cabinet imaginaire: Natures mortes et vanités du XVIIème siècle, 10 May-4 September 2005. This supremely elegant picture is one of the earliest independent still lifes in the history of Western art. Born to a dynasty of German painters, Ludger tom Ring the Younger specialised in portraits and floral still lifes, a genre he helped to define as early as the second half of the sixteenth century, and in which he achieved an unparalleled mastery more than four decades before the Dutch and Flemish artists of the Golden Age. Only three examples by his hand survive in this genre, this picture being the last one to remain in private hands and, as such, is a genuine rarity. A master of composition, Ludger tom Ring sets in this narrow panel a simple, almost minimalistic arrangement of crisply designed and meticulously painted flowers against a dark background, creating a stark contrast of patterns and colours that proves strikingly modern. Tied together by a thin string, four white narcissi dominate the arrangement, with yellow calamine violets and vinca minor purpurea, a kind of periwinkle, appearing at the base of the vase. On the tabletop lie stray blossoms and a sprig of ruta graveolus (also called rue or 'herb of Grace'). The elaborate ewer that serves as an improvised vase has previously been identified as alabaster or porcelain, an unlikely proposition as the handle is too thin for these materials. Its surface is clearly reflective and the complex trefoil shape of its lips suggest it is white glass, made 'à façon-de-Venise'. Though information about him remains rather scarce, Ludger tom Ring the Younger seems to have epitomised the learned cosmopolitan humanist-artist of the sixteenth century. Evidence suggests that after training with his father in his native Münster, he set out on a formative journey across Europe in the 1540s, visiting Holland and maybe England. His contact with the Netherlands is testified by a copy he produced of The Flight from Troy (1551, Münster, Westfälisches Landesmuseum), after an original by the Mannerist painter Lambert Suavius (Utrecht, Centraal Museum). A now destroyed Kitchen piece with the marriage at Cana (1562; formerly Berlin, Gemäldegalerie) also reflects his encounter with the works of his Netherlandish contemporaries and early still-life champions, Pieter Aertsen and Joachim Beuckelaer in particular. 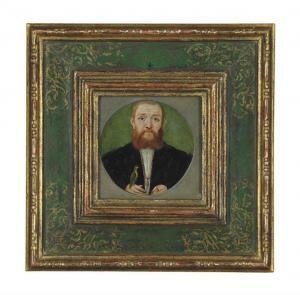 In a small 1547 Self-Portrait (Essen, Villa Hügel), he inscribed the day and hour of his birth, the date of the painting, and words consigning his art to the praise and glory of God. A man in the background holds a letter that identifies him as Josef Hesset of the Steelyard in London, thus indicating the artist's presence in England at that time, where he would have come to know the work of Hans Holbein the Younger. Displaying the modern self-consciousness of a true Renaissance man, these marks of authorship are echoed in the present picture by the prominent signature that adorns the jug. By elevating humble natural elements such as flowers as objects worthy of independent artistic depiction, tom Ring was dramatically breaking from an established pictorial tradition whereby plants appeared mainly as bearers of Christian symbolism in larger religious compositions. Lilies, for instance, would almost invariably be included in scenes of the Annunciation as symbols of the Virgin's purity, for example in Robert Campin's Merode Altarpiece (New York, Metropolitan Museum of Art), in which, incidentally, the sprig is also in a jug with a trefoil lip. Even Memling's Jug of flowers painted around 1490 (Madrid, Museo Thyssen-Bornemisza), often hailed as the first autonomous still life, was actually the reverse of the portrait of a donor praying to the Virgin. Its flowers were highly symbolic and its vase bore Christ's monogram. While some of tom Ring's flowers in this picture may well have maintained their Marian associations - violets and other small flowers could be considered emblems of faith and humility - narcissi were notoriously earthbound. It seems that in the sixteenth century, an age marked by the dawn of a new curiosity towards the natural world, with the publication of numerous botanical treatises and the study of new species brought from the New World, flowers could finally transcend their religious associations. In keeping with this spirit, new functions were emerging for painted flowers. Contemporary references mention paintings that were set into cabinet doors and counters in apothecary shops, and it has been suggested that this picture served such a function (Lorenz and Trescher, 1996, op. cit., p. 390). 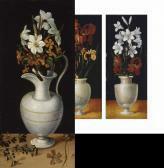 The small scale of Still life with flowers and the fact that it has been cut slightly on the right suggests its actual use in this capacity. The choice of flowers is also quite eloquent in this context: narcissi were known for the narcotic qualities of their bulbs, from which their name derive, while the ruta graveolus on the ledge was not a decorative plant but a kind of aromatic cooking herb. Its casual placement next to rather than in the vase suggests a different use for it, potentially pharmaceutical. This new inquisitiveness was still embedded within a religious frame, however. 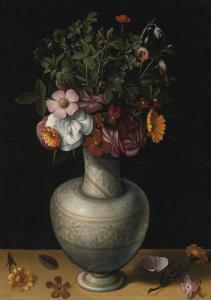 Tom Ring's two other surviving flower pieces, now in Münster (Westfälischer Kunstverein) bear the following Latin inscription running diagonally across the swell of the vase: 'IN VERBIS IN HERBIS ET LA[PIDIBUS DEUS]', or 'God is in words, in plants and in stones' (often quoted in Renaissance scientific texts). The idea that God's attributes were revealed in the beauty, order and intricate structure of the universe existed in philosophical and theological treatises since at least the fifth century B.C. It was expressed in the Bible with the story of Creation and played a significant role in Protestant thought of the sixteenth and seventeenth centuries. This argument was central to the pharmaceutical theory and practice proclaimed by Paracelsus a quarter of a century earlier, who used it to advocate the use of medicines at a time when medicine and alchemy were seen by many as one and the same. This provides a further proof of tom Ring's erudition and to his being attuned to both the theological and scientific debates of his day, two concerns he united in delicate works such as this one. James Bruce-Gardyne, Senior International Director and Head of Private Sales in Old Master Paintings, discusses Ludger Tom Ring II's Narcissi, calamine violets and periwinkle in a ewer, on a ledge with a sprig of rue.